"Simple to use, difficult to master"
Pebble has left the building, but who will take its place? Is there even a space for 'geeky' wearables now that fashion has caught up with technology? Montreal company Mighty Cast certainly thinks so and is going all-in on the idea, with a device that's very little about fitness and very much about the connected, hacking self. 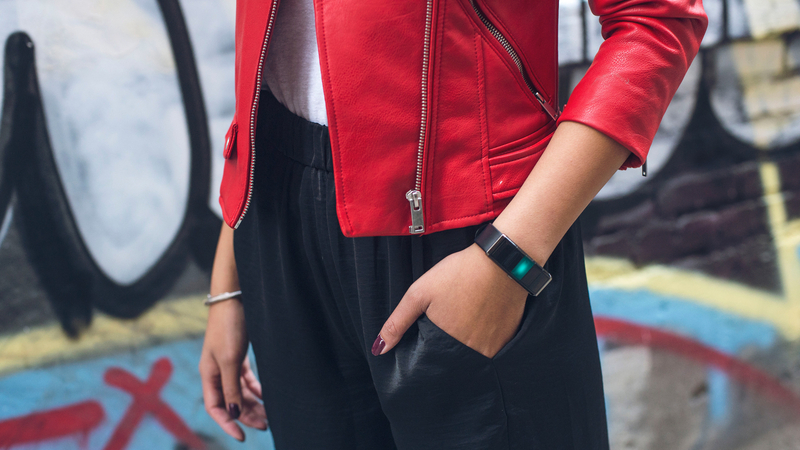 You may have heard of the Nex Band last year, but it never actually launched. Now it's back with a new look and a new name – the Nex Evolution. After a beta period of focus-group testing, CEO Adam Adelman says Mighty Cast "swallowed the bitter pill" and went back for a redesign, gave the band a facelift, dropped the swappable modules, and went deeper on the digital customisations instead. Now it's back, but what is Nex? If you've used IFTTT (If This Then That) you'll have half an idea – in fact, IFTT support is built in – but the Nex Evolution offers a more basic proprietary language called When/Do. Simply, 'When I do this, Do that'. Rather than just giving users a bunch of pre-set functions, the Evolution lets you build your own and share them with other Nex users. You might, for example, have a function where tapping the middle button once turns the band into a music controller, or a When/Do where two taps drops your pin-location onto a map and sends it to your friends. Maybe you just want something to open the garage door – the Evolution might be most useful in the smart home. Each of the five on-band buttons is separate and 'hackable'. It's perhaps a bit of a risky idea, when most tracker wearables on the market right now have a heavy focus on fitness, but Adelman isn't convinced people are getting long-term use from their Garmins, Fitbits and Misfits. "The retention rates only tend to be about two months," he says. "What we found was pretty interesting, after all this testing – and especially the demographic we were going after, which is a bit of a younger, kind of teenage, college aged-20-something demographic – is that there's no killer app. Everyone wanted to use their device for a different reason." The idea was to build something "that could be a brand new band every day", says Adelman, and so the company focused on more of the digital customisation for the final product, ditching the physical modular element of the beta version ("People were much less interested in the shareability of the individual mods"). All that said, the Evolution still tracks your steps, calories and distance out of the box (with the accelerometer), and Adelman says they may broaden this if people really want it, but for the most part it's about making cool custom mods and using your arm to converge the real and digital worlds. You can also set up an inner circle of friends and see the hacks they've created, and one particularly neat 'hack' Adelman describes will make the band light up when it's in proximity of any of your friends. "We're really trying to build up a community around this over time," he says. "We're focusing on as many creative hacks as we can and soon we're going to move into the next stage, which is really community." For people who want to get more grease on the fingers, there's also IFTTT support and some other APIs. "We've a maker channel so you can program Arduino Robots if you wanted to, so it's like a little API within the app itself for more advanced coders to take advantage of. But for all the simple hacks, it's as simple as three seconds of pressing when and do." So does this mean Nex is eyeing Pebble's spot? "Not really," says Adelman. "I think Pebble did an amazing job of building a community around that geek chic you talked about, but because it's so much easier to create experiences you don't have to create a separate application for example that's available at a third-party store… We're catering towards a younger demographic, a social demo, a maker demo, and to some extent a gaming demo." It may be in gaming that the band has most of its potential. Mighty Cast has a deeper SDK that it's making available to select gaming partners, and while Adelman won't say who, he hints at using the device with VR and even AR. In New is working on a game called Magic Maru that will be an app, but will also require some activity with the physical band itself. There's even potential here for using the Evolution as an augmented reality gaming device. In fact, Mighty Cast has been working with Pokémon Go creator Niantic on a wearable for its other location-based smash hit game, Ingress. "One of the verticals we are excited about is augmented reality and casual gaming. Because our band is geo-aware there are all sorts of fun gaming applications we can do with that. We've been working with Ingress developing an interesting proof of concept. We haven't announced a launch date yet for that, but we're pretty excited about it". The Ingress band will look and behave much like the Nex Band, but instead of solid LEDs it will light up in the Ingress logos. It will also have a few extra capabilities for Niantic's game. Sadly, Adelman confirms there's nothing in the works for Pokémon Go. He does reveal a partnership with GoPro though, set to be officially announced in the coming weeks, which will let Band users control their action cameras remotely from the wrist – something Polar has opened up on its devices too. Mighty Cast has just soft launched its Evolution Band and plans to ramp up momentum as it heads towards the lucrative Holiday period. We'll be testing it ourselves in the coming weeks to see how much fun the tinker-friendly wearable is. It's undeniably refreshing to have something that sets itself aside from the pantheon of health-focused fitness trackers, but its success will most probably be determined by the community. Adelman describes it as "simple to use, difficult to master".